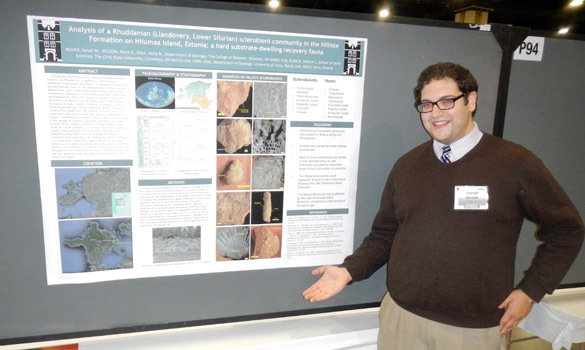 CHARLOTTE, NORTH CAROLINA–The brave souls Jonah Novek (’13) above and Kit Price (’13) below were the first Wooster students to present their posters at the 2012 Geological Society of America meeting. Jonah worked in Estonia this past summer on Early Silurian recovery faunas in the Hilliste Formation on Hiiumaa Island. 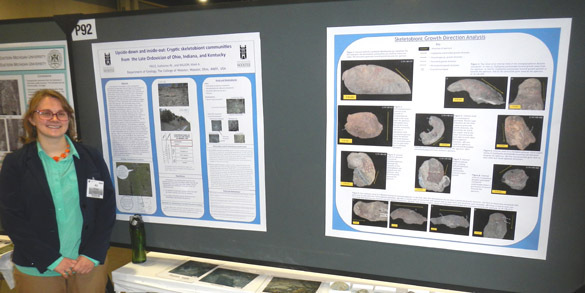 You can read his abstract directly here, and you can recall his field adventures by searching for “Jonah” in this blog. Kit collected Upper Ordovician cryptic sclerobiont fossils in Indiana in the late summer. Her abstract is here, and you can see her work in this blog by searching for “Kit“. Jonah and Kit started off our GSA presentation experience with confidence and joy.